The British. government has asked Germany to lease their Auschwitz concentration camp along with other WW II internment camps, as part of their final solution to the Irish problem. One German official has said off the record, “We have these camps sitting empty since the 40′s, so we may as well put them to use. They may take a bit of refurbishing but, there is no question we can get them up and running quickly.” With the breakdown of the peace process in Ireland following British non-compliance, Auschwitz with its gas chambers has now being agreed by Furhrer Fuhrer Paterson with his unelected fellow Englsih Reichsführer-SS PSNI Matthew Baggoas as their final solution, to liquidate the Irish problem in Occupied Ireland. Auschwitz concentration camp a network of concentration and extermination camps, used by the Third Reich was annexed by Nazi Germany during World War II. The largest of the German concentration camps, Auschwitz has now being designated by Owen Paterson the British successor of Ghengis Khan for occupied-Ireland and his fellow englishman, the Reichsführer-SS PSNI Matthew Baggot from London, as the place for the "final solution of the Irish question in British Occupied Ireland". Friendly SS PSNI staff will were there to assist the Irish holidaymakers according to Baggot's press secretary from London who has assured the public that all SS PSNI staff will be very busy, working hard to ensure the camp experience is as enjoyable as possible for the Irish. The British plan helicopters and transport trains via the port of Dun Laoghaire, with the compliance of the other British neo-colony in Dublin to deliver the Irish to the internment camp's gas chambers from all over occupied-Ireland. 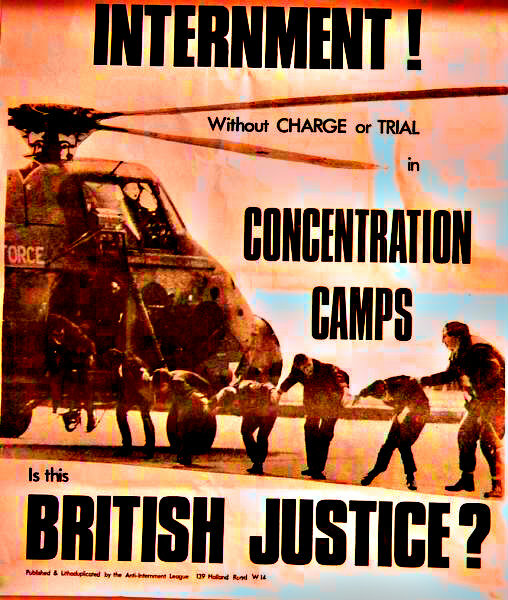 Presently there are quite a few Irishmen interned without trial by the British, along with a woman called Marian Price who has been tortured in solitary confinement for almost a year now without trial.There are also some Irish in British prisons who after interrogation at the PSNI Gestapo headquarters are now imprisoned in British Nazi camps for political prisoners, for years waiting vainly for some sort of a trial even without a jury, with a chance to plead their case. They are also discussions with the Government in the south to operate a form of compulsory emigration on all of the island, to get rid of the dole queues, those on disability and some of the younger old age pensioners, to give these excess Irish some work experience, after they pass through the iron gates crowned with the infamous motto, Arbeit macht frei "work makes free." The Irish will initially have to work in the associated munitions factories, except on Sundays, which are reserved for cleaning and prayers. The harsh work requirements, combined with poor nutrition and hygiene may lead to some collateral damage or deaths among the prisoners prior to gassing after they are past their sell by date. Within Auschwitz there is a "prison within the prison", where dissident Irish will be punished by being forced to spend their nights in "standing cells" which are similar to Marian Price's current cell, where they will be forced to dance a few jigs and then work with other prisoners during the day. The "starvation cells" in the basement is where prisoners will get neither food nor water until they are dead, as opposed to the force feeding last time of Marian Price for 200 days on hunger strike. The basement also has "dark cells"; with just a small tiny window and solid door, where the Irish will be placed in cells to slowly suffocate to prevent any further waste of Britain's free, precious, dwindling, oxygen supply in Ireland. Some of the unrepentant Irish fenians, will be hung with their hands behind backs for days, occasionally dislocating some of their joints, similar to the effects of torture treatment for which Britain was already found guilty by the European Court of human rights in Strasburg. It is understood that Fuehrer Paterson has already given the order for the final solution of the Irish problem to his fellow englishman, the the Reichsführer of the SS PSNI, to carry out the order. Later on the British plan to use Zyklon B for extermination at Auschwitz in its gas chambers with a state of the art crematorium to burn all evidence of the Irish off the face of the earth, as the previous British Holocaust engineered by the British famine while killing over 6 million was unsuccessful in eradicating all of them.The extermination camp, is designed to hold several categories of Irish political prisoners ultimately being an extermination camp, after they get a bit of work out of them. The first gas chamber will be called, "The Little Green House," a luxurious gassing facility, so named because the smoke will be green with fhe fine dust of their mortal Irish bodies, ascending to heaven, as a tribute to their centuries of suffering in their vale of tears in Ireland, where it is planned to exterminate all of the remaining Irish, with the exception of Martin McGuinness who has given it the nod in Stormont, accepting in the interest of cross community co-operation, the extent of the cold-blooded slaughter, based on the sheer scale of the menace posed by the Irish, which threatens the free world at this time. During the last war preceding the next one, a Scottish, an English and an Irish soldier were captured by an S.S. officer, who says,“ Before du go in to die concentration camp, I vill give each of you vone hundert lashes , but since yous have vought bravely I vill give you one vish each.” He turns to the Scot and asks him,“Vhat is your vish ? ” The scottish soldier replies, “I would like one of your wee S.S. jackets to put on me when you are whipping me ”“Your vish is granted,” says the S.S. officer and he gets a leather S.S. jacket to put on the Scot and when he has it on, he gives him one hundred lashes with his whip, then the Scottish soldier crawls into the concentration camp.